The unspoilt stretch of Dalmatian coast has long been regarded as one of the most beautiful parts of Europe. There are spectacular beaches, secluded coves and gorgeous green islands floating on a sapphire blue sea. 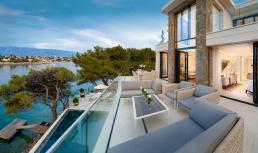 Residence Royale has some luxury holiday villas for rent in Dalmatia with spectacular sea view. 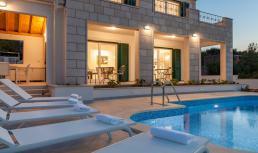 Look at our selection and rent a luxury villa for an unforgettable holiday in Dalmatia. Villa Marisol is for rent in Rogoznica in Dalmatia (Croatia) with private access to beach and sea. 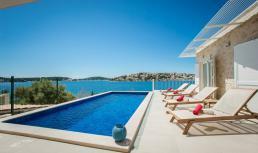 Wonderful new villa for 8 with private pool, air conditioning, WiFi internet and stunning sea view! 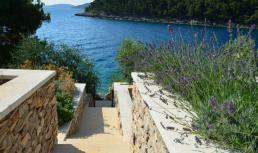 Villa Maude is for rent in Orebic on the Peljesac peninsula (Croatia), front line beach. Wonderful vacation villa with 4 bedrooms, 4 bathrooms, air conditioning, WiFi internet, private pool, and a private pebble beach and mooring for a small boat! Villa Victorine is for rent in Stomorska on the isle of Solta, only 10 m. from the beach. Magnificent vacation villa for 12 with 6 bedrooms, 5 bathrooms, air conditioning, WiFi internet, a heated private pool and stunning sea view! Villa Tatiana is for rent above Makarska in Dalmatia (Croatia), only 2 km. from the beach. Wonderful, modern villa for 8 with private pool, air conditioning, WiFi internet and panoramic sea view! Villa Annika is for rent near Selce on the isle of Brac (Croatia), only 1500 m. from the beach. Lovely, modern vacation villa with 4 bedrooms, 3 bathrooms, air conditioning, WiFi internet, private pool and stunning sea view! Vacation villa Amalia is for rent near Milna on the isle of Brac (Croatia), only 115 m. from the beach. Lovely, modern vacation villa with 4 bedrooms, 4 bathrooms, air conditioning, WiFi internet and private pool. Perfect villa for a family holiday! Vacation villa Bernadette is for rent in Sumartin on the isle of Brac (Croatia), directly on the water’s edge. Magnificent vacation villa with 4 bedrooms, 4 bathrooms, air conditioning, WiFi internet, pool, sauna and private mooring! Holiday villa Katya is for rent near Splitska on the isle of Brac (Croatia), only 100 m. from the Adriatic Sea. Lovely, recently refurbished holiday villa for 8 with air conditioning, WiFi internet, Jacuzzi, heated pool and sea view! 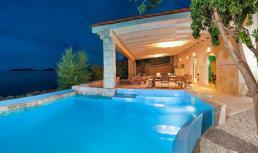 The luxury villa Paradiso is for rent in Streser on the Peljesac peninsula, first line beach. Splendid villa with 6 bedrooms, 6 bathrooms, air conditioning, WiFi internet, private pool and private pebble beach with jetty! 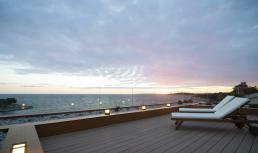 This splendid villa with private beach is located in Bilo near Primosten. Splendid villa with 4 bedrooms, 4 bathrooms, infinity pool, jacuzzi, air conditioning and WiFi internet!